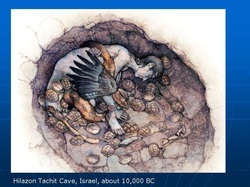 This carefully constructed grave was made around 13,000 years ago in a cliff shelter at Hilazon Tachit in Israel. Around the time that the Natufian 'experiment' ended, another development started, this time in southern Turkey around Urfa. At Göbekli Tepe evidence has emerged since the 1990s showing complex, carved stone structures pre-dating anything similar. They are currently interpreted as open-air temples. It used to be thought that organised religion emerged when humans lived a settled way of life and built villages.The implication seems to be that these structures at Göbekli Tepe provided the first impetus towards the social changes that led to farming and a settled (sedentary) way of life. Finally, Atlit Yam is a submerged site off the Israeli coast where evidence for an early farming community has been sealed by waterlogged sediments. This fishing community left behind evidence of its nets and catches of fish. Crops grown included grapes and wheat. Some kind of shrine of standing stones surrounded their freshwater spring, and forensic analysis of skeletons has revealed the earliest example of human TB as well as a suggestion that deep-water diving left some men hearing-impaired.